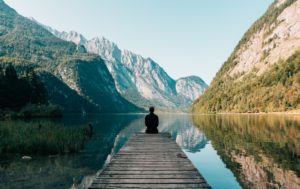 What is Mindfulness and how can it help me negotiate the litigation minefield? Mindfulness involves having a clear, non-judgmental awareness of your inner and outer worlds. Some describe Mindfulness as being “in the zone” or in a “flow state.” For those of us in the legal profession, it often means dealing with conflict from a receptive rather than reactive point of view. So how does that help lawyers and clients in mediation? Mediation is about trying to find common ground. Winning and losing is not the goal of mediation. The goal of mediation is resolution. If you enter into mediation brandishing swords and shields, you are not likely to find common ground. If your adversary perceives conflict and aggression in the mediation conference, she is going to pick up her sword and shield and let the battle begin. On the other hand, if you approach mediation with a receptive, open mind, that energy will be transmitted to the other side and the entire process becomes more result-oriented. Often, our clients simply want to be heard. If your adversary feels genuinely heard, that makes a resolution more likely. We can then concentrate on the parties’ interests rather than their adversarial positions. The mediator too can attempt to carry mindfulness into his role as a mediator. The parties and their attorneys need to feel that the mediator is listening to AND hearing their stories. If we can mediate from a receptive “flow state” the mediation is more likely to resolve conflict. The participants will, hopefully, transition into more receptive and open positions. The benefit for me is that if I approach the mediation with a sense of genuine curiosity it becomes an enriching process of discovery. For all these reasons, I am trying to add mindfulness to my Mediator’s Tool Kit.